The Collision Repair Education Foundation on Friday announced it, insurers, I-CAR, MSOs, OEMs and others bestowed more than $500,000 in Ultimate Collision Education Makeover grants this year. The money will support the next generation of repairers at 173 schools in 37 states, who together count more than 6,700 students in their collision programs, according to CREF. The organization classifies schools into three tiers of student industry readiness, and the Makeover grants are intended to help the lower two tiers advance and the top tier “to further expand their program’s capabilities,” CREF wrote in a news release. The largest single amounts awarded to a single school came in at $25,000. CREF gave $25,000 each to Texas Southmost College in Brownsville, Texas, and the Thornton Fractional School District Center for Academics and Technology in Calumet City, Ill.; and Chicago-based Kennedy King College won the $25,000 Insurance Auto Auction Award. See the full list of winners below. Thornton Fractional Center for Academics and Technology collision repair instructor and career and technical education division leader Jorge Navarrete said Tuesday the school would use the money for a new downdraft paint booth. He said the program had been awarded things like materials in the past, but not an actual grant. The school’s old booth had been an early 1990s Spraybake, a brand no longer manufactured, and it’s time to “put it to rest,” according to Navarrete. Navarrete said the grant allowed him to persuade school officials to put up the remainder of the cost for a new booth rather than just buy a new exchanger. The new booth also would expose students to current shop technology, he said. The program is taking bids for the new booth now and hopes to have it installed during Christmas break given the lengthy installation time. At worst, it would have the booth this summer, Navarrete said. The college’s two-year, two-hour program teaches students a range of skills, including estimating, basic welding and body work, according to Navarrete. It has won the state level SkillsUSA in refinishing and produces a “World of Wheels” car annually. It also performs repairs for actual customers. Our interview with Navarrete also offered perspective into one trade school and its students, information which might be of interest to the industry — particularly shops looking to hire. Future plans: Navarrete said he has had many students go on to two-year technical schools and some going right into the collision industry after graduating Thornton Fractional’s high school-level program. Others will work in collision repair for a few years to pay for a four-year college — but then “kind of move out,” Navarrete said. He said he had many students move up to roles like head painter, estimator and manager, but few making a career out of the shop floor. Navarrete said he even warns students that while they might make more money at first than with a bachelor’s degree, the industry might cast them aside in favor of someone younger. They should still pursue a bachelor’s degree as a backup plan, he advises. A story from Navarrete’s own career reinforced that sentiment. He once served under a head painter who couldn’t paint the vehicles the boss brought over at 5 p.m. because of issues like family commitments. The young Navarrete would stay behind to do the work, and ultimately the boss dropped the head painter of 26 years in favor of Navarrete — which Navarrete called a “pretty crappy thing to do.” Navarrete resolved to get a backup degree after witnessing this. Disconnects: One issue for students has been a shift from commission-based paychecks to hourly rates at many regional shops; his students prefer commission plans, Navarrete said. A $14/hour head painter job was not attractive, and he said he tried to get his students work at larger shops able to offer benefits. Navarrete said he tries to place students at smaller shops to begin their careers so they can afford tools, but eventually have them move up to larger shops. He said there appeared to be a “disconnect” between the equipment present at the two tiers, which can discourage students at the smaller facilities. Work ethics: Navarrete said he is having an issue with students desiring instant gratification. 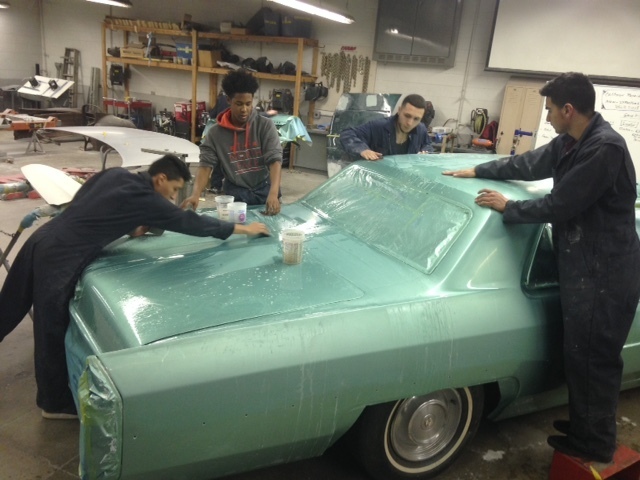 Everyone wants to to paint the school’s annual “World of Wheels” restoration vehicle, but no one wishes to put in the hours on less glamorous work like its rust repair or bodywork, he said. Students might weld a part on the show car with insufficient precision, and Navarrete will demand they cut it off and do it again, which he called “part of learning.” He said he tries to instill that an employer wouldn’t pay for a redo if a tech did it wrong on a customer vehicle, and he attributed the program’s SkillsUSA success to demanding this elevated standard. Real-world skills: As noted above, Thornton Fraction works on actual customer vehicles, and “I try to run it like a real shop,” Navarrete said. Cars have a delivery date, and students might have to stay after school to get it done, he said. Though Navarrete approves their work, his classes estimate the vehicles in CCC One, and “they’re kind of in charge of the job.” The students are also responsible for communicating any additional damage to the customer (Navarrete is CC’d on communications, however) to teach professionalism. He said students are often shy and “they want me to talk for them.” (He noted they’re more used to text messaging than talking.) However, he insists they communicate with the customer to teach the people skills needed in the workforce, regardless of whether the students stick with collision repair.